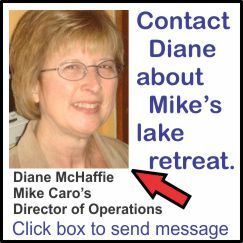 It’s time to tell you about the lake itself. If you search the Internet, you’ll discover that almost everything people say about Table Rock Lake is positive. There are good reasons for that. It’s one of the most scenic lakes in America. And although it has almost 800 miles of shoreline, you’re never overwhelmed by its size. That’s because it’s not a big round body like many lakes. Instead, it meanders across the terrain, with arms reaching into forested hills on all sides. There are coves always nearby. And smaller coves branch off from larger ones. Although there are several wide areas, you can always see the opposite shore from wherever you are. I like that about Table Rock Lake. I never enjoyed being isolated in a body of water, so far from land that I couldn’t see it. Some people like ocean-like lakes where the beach is over the horizon. But that seems too lonely and too far from the friendly furry creatures in the forest for me. I want to be close to shore and occasionally see deer drinking in the coves. If you like to fish, Table Rock Lake is world class. In fact, it hosts many bass tournaments and is frequently a prime choice for fishing simulation software. This lake is legendary. Although I’ll provide a few links at the bottom of this page, you might want to research TRL on your own. Fishing season is forever on the lake. You don’t need to worry about when you can and can’t fish. Licenses are very cheap for residents — $12 a year. No license is required if you’re at least 65 years old or under 16. There are many species of fish, with the main ones being bass, catfish, crappie, and bluegill. There are few trout in TRL, because it’s a relatively warm-water lake. You can sit and fish productively from shore behind the house or in the small cove surrounded by the property. It’s serenity amplified. Boats of all sorts cruise other parts of the lake, from fast ones with big motors to paddle boats. Jet skis and water skiing is fairly common in some areas, but not in the secluded arm of the lake where the property shares the shoreline. Actually, the shoreline is managed by the Corps of Engineers. That’s either good or bad, depending on your perspective. And I’ll discuss it in a minute. 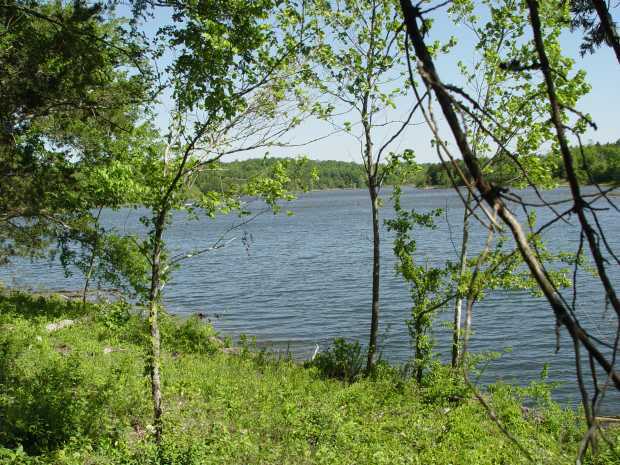 If you’re looking for a “party lake” with plenty of noise and rowdy behavior, this isn’t it — although there are some areas far from the property where that activity is a bit more common. For a party atmosphere, try Lake of the Ozarks to the north of here. 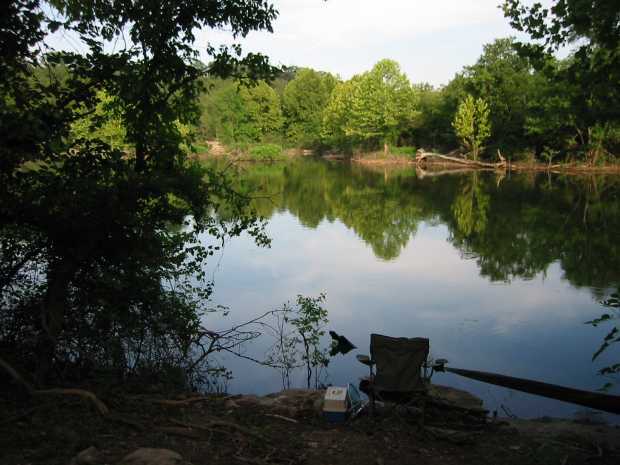 Many people prefer that, even some of my friends, but I came to the Ozarks primarily for solitude. So, if I were to nitpick Table Rock Lake, what don’t I like? Good question. Even though there’s less fluctuation in water level than many large reservoirs, I sometimes wish the water would stay at exactly the same level all the time. During the prime summer months, the water is always plenty high and sometimes extremely high. It can cover the bottoms of trees along the shore. And some years, mostly in winter, the lake goes down so much that you have to walk to the left below the house to reach the water. This Google Earth screen capture shows the locations of: (A) The main house (yellow pushpin at left-of-center in lower portion of image); (B) Shell Knob (farther left, just above vertical center), used for the mailing address, but actually 7.5 miles away, measured in a straight line; (C) Branson, Missouri (upper right); and (D) The Table Rock Lake dam (just above vertical center, mid-right). The property is in Missouri, with the Arkansas border about a mile and a half to the south. There’s a bit more of Table Rock Lake than you see here, but this is the central portion. Those tend to be rare happenings and don’t last long. TRL seems to be managed so that its levels are more constant than neighboring reservoirs in the White River chain of five nearby lakes (Beaver, Table Rock, Taneycomo, Bull Shoals, and Norfork). To check this out for yourself, click on the link I provided to historic lake levels (bottom of this page). There you can see the day-by-day stats, courtesy of the Army Corps of Engineers. Another fact that might be a negative for you — but a positive for me — is that you don’t actually own the land all the way to the shoreline. A ribbon around the lake is managed by the Army Corps of Engineers. You can’t build there. You can’t cut large trees, although you can remove small ones with a $20, five-year vegetation permit. And, technically, anyone could land a boat and walk your shoreline legally — although they’re not allowed to camp. In my 11 years living here, nobody has ever set foot on my remote shoreline, except for me and my guests. A path below the cabin leads to here, where the shoreline to the right leads into the small cove and the main lake is to the left. Why do I like the idea of a Corps Line? Simple. It means that the beauty of the surrounding forest can never be destroyed. And it means that I effectively have more acreage than the 41 acres I officially own, because the area beyond the Corps line isn’t counted. On the positive side is almost everything else, including the fact that Table Rock Lake has amazingly few mosquitoes. I was used to other lakes where mosquitoes were a significant nuisance. Shoreline: Roughly 750 to 825 miles, depending on water level. Area of water surface at normal level: About 67 square miles. Water temperature is comfortably warm from mid-June through mid-October, but is tolerable at other times, too. Fishing is legal all year. Resident fishing license: $12 annually and free for 65 and older or 15 and younger. Marinas: 15. You can lease boat slips at these or spend the day in adjoining picnic areas. Note: Private community boat docks are allowed in designated zones. There is no dock zoning on the original property, but I acquired an adjoining 10 acres, which can be purchased separately for $39,500, where a planned subdivision has dock zoning. I also launched small boats in the “hidden” cove surrounded by the property. I tied them to trees when walking back to the house or cabin. Ice fishing: None. Table Rock Lake is too far south for that. Table Rock Lake dam completed: 1959. Boat types: Comfortable pontoon boats with tailored seating and canopy tops are a favorite. Everything from paddle boats to houseboats — including rowboats, cabin cruisers, sail boats, houseboats, kayaks, speed boats, canoes, paddle boats, and bass boats — are common. There isn’t much boat traffic near the property, due to its seclusion. There is no limit on engine size, though even a two-horsepower outboard or an electric trolling motor will get you around in this arm of the lake. Swimming: Swimming is generally safe throughout the lake and you can dive in right from the property’s shore. Water skiing and tubing is also popular in other parts of the lake. Dangerous waves: Extremely rare and completely absent from the lake near the property. The normal water behind the main house and cabin typically has small ripples, when it isn’t glassy calm. Storms can generate medium waves. Number of alligators and crocodiles: Zero. 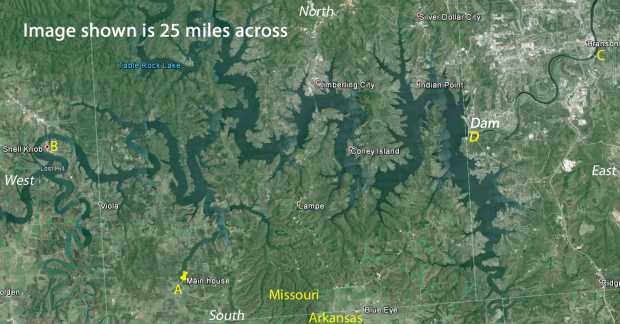 Below are some selected links about Table Rock Lake.